For me it all started around 2007-2008. I didn't really have that many credit cards to begin with - just a couple with the major creditors and some store cards with manageable, interest-free balances. I was finishing up college, earning money, had been renting my own apartment, and had been making my own financial decisions for a while. I put a vacation to Europe on an "unlimited" card, plus college tuition and books on another. I never missed a payment, until once my check came in one day late due to a post office holiday. Unfortunately, that one day, one time set things in motion which sent my debts soaring and my credit score tumbling. My interest rate got hiked astronomically on my unlimited card due to the financial crisis that was happening at the time, and I went from having $75-150 total credit card minimum monthly payments to $500-$700 minimum monthly payments on just the unlimited card, which I couldn't afford. Rather than chip away at the iceberg of rapidly multiplying debt, I decided to take control immediately and entirely and chose to go the debt settlement route with all of my cards, including the store ones. I felt so betrayed by the same companies who had previously wooed me and my 800-pt credit score not so long ago, that I decided I would just settle, eat the credit score hit. I researched many debt consulting agencies, and eventually went with one that was located in an entirely different state from the one in which I resided. As soon as I spoke with Bobby for the first time, I felt empowered. Immediately from the get-go, Bobby and his team made me feel very comfortable and well-informed. Everything was explained to me fully, every question (however silly I believed it to be) was answered patiently and thoroughly, and I felt confident in my decision to choose their debt settlement services. Everything was prioritized correctly, as I had several creditors to settle with simultaneously. Bobby and his team never hesitated to reach out to me and always kept me informed of what was going on. I have had so many friends who have made poor investment choices into failed businesses decide to go with other debt consulting and settlement agencies locally only to be very much screwed over by the very people who were supposed to help them. DSN's tireless work delivered the results promised no matter how tough the obstacle. Throughout this whole process, Bobby always championed for me and told me that I would come out from this a much better person, and it's true. I learned many valuable financial lessons from this experience, and prefer to avoid dealing with creditors (I deal with two banks only and directly). While before I would have jumped at the opportunity to use cards for perks regardless of the fact that I had the cash to pay for what I needed, I would turn and run without a second thought today knowing what lies up the banks' sleeves. Though I hope to never be in a similar situation again, if for some reason I were, I would choose to work with DSN again in a heartbeat. But since I steer clear of creditors these days, all I can do is recommend their services to anyone who does need them at this time. Thank you Bobby, and thank you DSN! Take care and thank you so much again for all of your help and hard work! "I got myself into credit card debt and it was getting overwhelming, just making minimum payments and feeling like I was getting nowhere. I contacted Debt Solutions Network and was put in touch with Bobby, who made it so easy for me to take the first step towards financial freedom. I sent him all the paperwork on each of my bills and he got in touch with the various credit card companies, worked with them to come up with a settlement number and a payment schedule that would work for them and me. I got my debt paid off in three years! I would still be drowning in interest and debt if it were not for Debt Solutions Network and Bobby. Thanks so much for making my life so much better and teaching me how to make better financial choices." Hey Debt Solutions Network, Chris & Bobby .......just want to thank you all for the wonderful care I received from your company, always with a personal touch. When I began I was overwhelmed with debt but you folks always set my mind at ease & for this I'm so grateful. I THANK YOU for your assistance on my journey in becoming debt free.............Satisfied & happy customer! 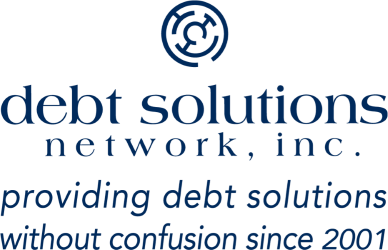 "There are no words to express my gratitude toward Debt Solutions Network and its wonderful and caring executives, Chris and Bobby, and the rest of their staff. The very first time I called the company, I knew I was in good hands. They explained the steps on how to become debt-free and stick to the plans with no pressure, no tricks. Every time I have a concern, either Chris or Bobby returns my calls with good explanations. They are so professional and courteous! We couldn't have gotten out of this money mess without their assistance. Debt Solutions Network is commendable!" "I enrolled my grandmother into this Debt Settlement Program about two and a half years ago. She was on the verge of having to move because she couldn't afford her rent. Decades of credit card debt had caused her to move in with family members at times, pay ridiculous amounts of interest to quick loan establishments as well as pay late fees. Relationships were strained because of the feeling that they couldn't be happy because she was in such a mess. Small loans from family members caused tension as they only kept her afloat, and the money was wasted. Her relationship with God suffered because He tells us to give to Him so that we can watch Him work. She didn't believe that she could afford to give to God. She isolated herself from others because she knew that they would eventually find out about her financial problems if she got too close. After enrolling in the Debt Settlement Program, her monthly payment became almost half of what she paid in minimum payments. This enabled her to continue to live independently and have more spending money to socialize. DON'T WAIT! Let Debt Solutions Network negotiate a fair settlement so that you can mend relationships and regain your sanity and freedom. Above all, let Jesus pay your sin debt. God will make something beautiful out of your life if you will accept Him." "Thank you so much, Debt Solutions Network! I'm finally debt-free! I'm sure my husband is smiling down and saying, 'It's about time!'" "When I first came to Debt Solutions Network, I had left behind an extremely bad marriage. Expenses from leaving that relationship and suddenly becoming a single-income family had completely maxed out my available credit, and as time went on I found myself completely unable to keep up. I would pay some accounts timely, but only the minimums, so none of my balances really went down. Other accounts I could not afford to pay just spiraled up and up with late fees and interest. This was starting to jeopardize my ability to take care of my children, and I was truly afraid that some small, single expense like a car problem would end up costing me what little savings I was able to keep. Debt Solutions Network set me up with a monthly payment that was the same every time, and worked with my creditors to get balances reduced and settled. In return, I had to pay settlement fees. I found these to be reasonable amounts and well worth it for two reasons. First, I never had to talk to the creditors again. Being able to answer my phone without fear was worth its weight in gold. For the first year, I literally kept Debt Solutions Network's phone number taped next to my phone and gave it to every creditor who called me. Secondly, the fees themselves were far less that I would have ended up paying if I had to pay the full account balances, late fees and interest. Knowing what I had to pay every month and receiving monthly statements that actually showed accounts going down, down and then AWAY was a wonderful feeling. Debt Solutions Network was always knowledgeable, ethical and available whenever I had a question or a concern. As a result, I've been able to focus better on giving my children what they need and on building my career security so that I will never in this position again. It's been wonderful to finally get to a place where I have some options and I don't have to worry every minute that the smallest thing could collapse everything I've tried to build. Thank you so much." 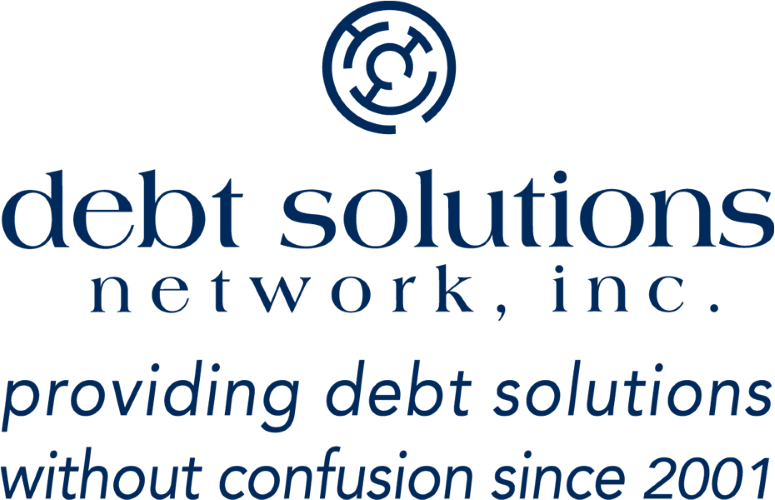 "We would like to thank Bobby and everyone else at Debt Solutions Network for all of their help and knowledge. We had lost two sons, our youngest in 2011 and our oldest in 2005. Our boys left their wives with no insurance and as parents we stepped in and helped their wives bury them. We were left in a big financial situation and we didn't want to file bankruptcy. My health was in pretty bad shape. I went from working every day to being unable to work. I had nothing left in me to deal with the financial stress. We called all the creditors and explained to them what happened and they gave us no way out. There was nothing they would do to help us. We called our accountant for help to write it off in our taxes, but the fact that our children were grown and because we loaned the money to our daughters-in-law, we were told we could bury our neighbor's children but we cannot bury our own and get a tax break. We called Debt Solutions Network and they took it from there. We were so lucky to have gotten Bobby on the phone, as he provided so much relief for us, it was unbelievable! Without him, I wouldn't have known what to do. We want to thank him so much for everything he did for us. I would also like to mention that Bobby really went out of his way making sure all the creditors were aware that they could have no contact with me. It really made a difference in my recovery! And the payment plan was set up just for us and our needs. Thank you from the bottom of our hearts!" "I highly recommend Debt Solutions Network for your debt problems, and believe me, I contacted a lot of companies before selecting Debt Solutions Network. The quality of service far exceeded anything that I expected. Bobby walked me through every step of the process and talked me through my panic calls. He was always available when I needed to contact him. With his outstanding help, I was able to eliminate all unsecured debt and an almost impossible to settle equity loan that I had been working on with the bank for over four years. I had even hired an attorney to modify or settle the equity loan with no success. Debt Solutions Network follows through on everything they promise. Get out of the debt stress, work with competent people and start fresh. It is the most wonderful feeling in the world!" "Debt Solutions Network, Your thoughtfulness and attention has been truly appreciated! Thank you for helping me through my hard times! I am so happy that I finally got them all paid off! Thanks again!" "My wife and I were deep in department store and other credit card debt we'd rung up. The Debt Solutions method of becoming debt free rescued us. It requires dedication and determination, but now, we're glad we chose to use their services. They did a great job for us." Thanks! "When I started the program.....my credit was horrible and I was unable to pay for these accounts....which were mostly in collections...on my own. I had recently divorced and the majority of those accounts were obtained during the marriage. Once joining the program, I was able to consolidate all the bills into one affordable monthly payment and pay off these accounts for less than what I owed! Debt Solutions Network you have been awesome....guiding me the whole way and answering all of my questions....even helping me with my credit report information. Now that I am finally finished with the program, my credit score is already way up from what it was when I started and I expect nothing but advancing it more in the months to come. This program was definitely a credit lifesaver. Thank you again DSN & Bobby for all your help and advice!! Wish you well!"